Congratulations . . . by starting to read this book you have just taken the first step toward becoming a Mental Millionaire. You probably want to read this book for several reasons. You wanted to improve yourself and your self-image, you wanted to gain more self-confidence, you wanted more peace of mind, and you want to get more zest out of living. In short, you want to obtain the very best this life has to offer and capitalize upon it to its fullest extent. 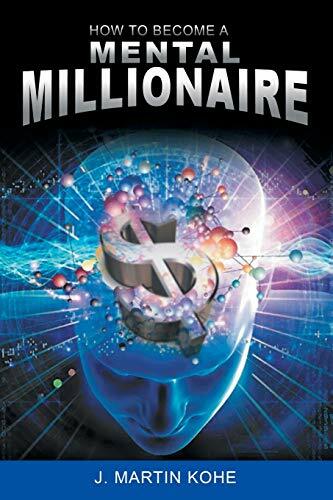 How to Become a Mental Millionaire features that readers can understand and use to become a "millionaire", lessons on how to make dreams manifest in real life. Kohe had earlier published a book entitled "Your Greatest Power", which was written to motivate and encourage readers to have the right thoughts and vision. He stated that a person's greatest talent is the power to choose. A person is the sum total of the choices they make up until the present moment, "How To Become A Mental Millionaire" complements "Your Greatest Power". Your Greatest Power teaches readers the right kind of thoughts or vision and How To Become A Mental Millionaire teaches the right application or action. J. Martin Kohe is best known for his work as an author and psychologist. His works include three books and a record. Dr. Kohe's most popular book, YOUR GREATEST POWER, has sold over 250,000 copies. His record HOW TO OVERCOME DISCOURAGEMENT includes a lecture on ten ways to deal with inevitable discouragement. Dr Kohe began his adult life as a lawyer, but gave up his practice to pursue a degree in psychology from Baldwin-Wallace College.